As vessels enter the Golden Gate bound for the Sacramento or San Joaquin Rivers, they first pass through San Francisco Bay, and then head north through San Pablo Strait and into San Pablo Bay. Two-mile-wide San Pablo Strait is defined by Point San Pablo to the southeast and Point San Pedro to the northwest. 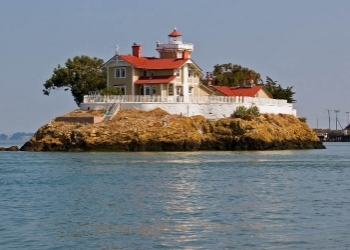 In 1870, the Lighthouse Board requested that a lighthouse and fog signal be established at or near Point San Pablo to guide the many steamers and sailing vessels passing through the strait. On March 3, 1871, an appropriation of $20,000 was set aside by Congress for the station. In the late 1960s the Coast Guard announced plans to automate the station. To save maintenance costs, the lighthouse was to be demolished and replaced by a light on a tower. The Contra Costa Shoreline Parks Committee launched an effort to save the historic structures, and in 1971, the station was placed on the National Register of Historic Places. This move prevented the building from being razed, but neither the Coast Guard nor other public agencies had funds for maintaining or restoring the buildings. For almost ten years, the East Brother Lighthouse received little attention, and the neglect started to take its toll as the wood rotted, the paint peeled, and the iron rusted. A non-profit group, East Brother Light Station, Inc., was formed in 1979 to restore the landmark and make it accessible to the public. Through government grants, private donations, and countless hours of volunteer labor, the structures on the island were restored. Today, day use fees and funds received through the operation of the lighthouse as a bed and breakfast are used to maintain the facilities. Five rooms are available on East Brother Island. Four are former keeper's quarters located in the historic lighthouse itself. 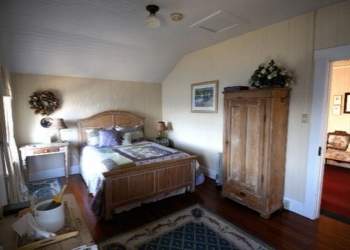 Each room, named for its view, is unique in decor and has a queen-sized bed. A smaller, more rustic room, known as Walter's Quarters, is located in the fog signal building. Away from the main building, it offers a unique sense of privacy. Breakfast is no less a work of culinary art. Full breakfast is served in the dining room, at 9:00am, for all guests. A house specialty, Lighthouse French Toast Souffl� is often served.